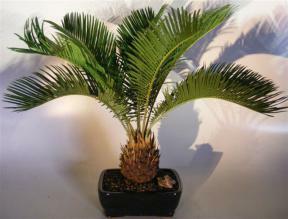 The Sago Palm is a long-lived exotic palm that tolerates neglect but thrives with attention. Adapts to indirect light or full sun and has a wide temperature range from 15 to 120 degrees F. A slow growth rate allows indoor specimens to remain in the same container indefinitely. Treat as a cactus -- water when almost dry and seldom fertilize. Great indoor bonsai. 15 years old. Approximately 22" Tall. Suitable humidity/drip tray is recommended. To purchase add $11.95.